CSR is the continued commitment by a business to behave ethically and contribute to the economic development and welfare of the society while at the same time improves the quality of life of its workforce, their families as well as the larger society. The national government, together with institutions like state corporations, the police and the judiciary among others are obligated to provide its publics with necessities and amenities that ease and make life worthwhile. Businesses, NGO activists and local communities have taken a lead in addressing those issues which the national government has failed or is slow to come up with solutions so as to ensure that the public’s life is comfortable. Social responsibility is an ethical or ideological theory that an entity whether it is a government, a corporation, an organization or individual has the responsibility to society. It is the economic, legal, ethical and discretionally expectations that society has organizations at a given point and time . The pressure on businesses to play a role in social issues is growing and over the last ten years, these institutions have grown in power and influence as they compete in playing CSR roles to a point where the public is forced to define a business by how much and how conspicuously it contributes towards CSR. The modern day business has almost capitalized on CSR, to create awareness that it exists, advertised its goods and services and demonstrated how philanthropic it is. Actually CSR is more of an advertising side show where the media plays an important role in ensuring that all and sundry notice that “we give back to society”. The largest corporate giving programs are driven by either strategic or commercial interest with their basic motivation being a combination of wanting to acquire greater market share, improve public image and to encourage staff motivation and competition in the labor market. Therefore, over the years, the brand and public image of a corporation has increasingly become CSR’s focal point providing support so as to look good and drive up sales. The major cry is that business organization plays CSR roles not with any hidden agenda but for the very purpose of giving back to the public who keeps giving to the organization by purchasing their products and services. The objectives of this review are: to give an overview of CSR practice, to bring to light wrong motives in CSR performance by some organizations and to give recommendations on positive CSR practices. This article reviews documents such as research studies, journals, scholarly texts and the internet. The review’s scope is both the public and private sector organizations that undertake CSR activities. CSR is viewed as a very current concept that is gaining ground through its metamorphosis from a social perspective to more of an economic one. This review paper looks at the theories of CSR that include instrumental, political, integrative and ethical theories. Approaches to CSR ranging from the meanest which is the obstructive approach to the most generous proactive approach are elucidated. The paper in addition analyzes the various CSR stakeholders and the important part they play in this venture, chief of which are the employees and the government. The paper reviews the contemporary issues in CSR. This touches on global issues, technology, environmental issues, HIV pandemics and other debilitating diseases. It goes further to critically analyze CSR as it is today, touching on issues of community development, employee diversity, the environment, market place practices, accountability and international relationships. The relationship between organizational stakeholders and CSR is also highlighted, chief among them being employees, shareholders, customers and the government. The paper concludes by saying that CSR is a vital component of a corporate activity which should be rid of all its malpractices. It recommends that organizations purpose to make CSR part and parcel of their day to day activities. There is also a need for adequate training on CSR activities and carrying out of social audits to gauge organizational ethicality in CSR conduct among others. Businesses have come to realize that giving back to society places one at a vantage point of growth and that the public forms the bigger chunk of the business customers. This review is very significant in many ways to the following stakeholders. To the businesses, they will recognize the importance of undertaking CSR as it is intended rather than take it as they choose for what they will understand the real intentions of CSR. To the business managers, shareholders and entrepreneurs alike, they will endeavor to make CSR part of their policies and ingrain it with other core businesses of the organization so that it becomes part and parcel of the normal business activities. To the members of the public, they will become aware of the intentions of CSR activities; understand their rights and the part they should play in CSR activities. Moreover, they will be in a position to contribute in suggesting what should be prioritized by businesses as they choose CSR activities. Scholars will be provoked to venture and explore the CSR field in order to come with more literatures on the CSR field. By coincidence or mere chance, most CSR activities are confined to the business world which unfortunately has little interest in scholarly work. There is a belief that one may not need formal education to conduct business and this has seen very few businessmen interested in writing. Finally the researchers will be able to note gaps in this review that could be useful for further research. Given that, CSR is quite a green area and that the scope of this review is its intentions and practice, then it provides a very fertile ground to research on. CSR means something, but not always the same thing to everybody   . One of the most prestigious scholars in this discipline called CSR an “electric field with loose boundaries, multiple membership and differing training/perspectives, broadly rather than focused, multidisciplinary, wide breadth, brings in a wide range of literature; and is interdisciplinary. CSR is a relatively modern concept and over the years, it has been progressively developed through several ground-breaking studies. Most scholars point Howard Bowen’s (1953) social responsibility of the business man as the first attempt to theorize the relationship between corporations and society that existed  - . In the 18th century, the great economist and philosopher Adam Smith expressed the traditional or classical economic model of business. This model suggested that the needs and desires of society could best be met by the unfettered interaction of individuals and organizations in the market place. The viewpoint expressed by Adam Smith over 200 years ago still forms the basis for free market economies in the 21st century. Adam stated that the market place participant must act honestly and justly towards each other if the ideals of the free market are to be achieved. In the century after Adams Smith, the industrial revolution contributed to radical change with introduction of new technology that caused large organizations to develop and acquire great power. Consequently, their founders and owners became the richest and most powerful men in the world. In the late nineteenth century, many of these individuals believed and practiced a philosophy that came to be known as “Social Darwinism”, which in simple form is the idea that principles of natural selection and survival of the fittest are applicable to business and social policy. This type of philosophy justified cutthroat, even brutal competitive strategies did not allow for much concern about the impact of the successful corporation on employees, the community or the larger society. Giving was done as individuals by the great tycoons of the time, but not as representatives of companies. Around the beginning of the 20th century, big businesses were criticized for being too powerful and for practicing antisocial and anticompetitive practices. Laws and regulations were enacted to protect employees and consumers and society at large. Between 1900 and 1960, the business world gradually began to accept additional responsibilities other than making a profit and obeying the law. Many called for the business world to be more proactive, ceasing to cause societal problems and starting to participate in solving social problems. Many legal mandates were placed on business related to equal employment opportunity, product safety, worker safety and the environment. Society felt that business should go beyond their economic and legal responsibilities and accept responsibilities related to the betterment of society. CSR theories can be classified into four  . This is the first group in which it is assumed that the corporation is an instrument for wealth creation and that it is its sole social responsibility. Only the economic aspects of the interactions between business and society are considered, so any supposed social activity is accepted if and only if it is consistent with wealth creation. They understand CSR as a mere means to the end of profits  . This is the second group of theories in which Parsons says that the social power of corporations is emphasized, specifically in its relationship with society and its responsibility in the political arena. This leads the corporation to accept social duties and rights or participate in certain social cooperation. This group includes theories which consider that business ought to integrate public or social demands. They argue that business depends on society for its continuity and growth and even for the existence of business itself. This forth group understands that the relationship between business and society is embedded with ethical values. This leads to a vision of CSR from an ethical perspective and as a consequence, firms ought to accept social responsibility as an ethical obligation above any other consideration. The world business council for sustainable development in its publication, “making good business sense” by Lord Home and Richard Walts, defined CSR as the continuing commitment by business to behave ethically and contribute to economic development while improving the quality of life of the workforce and their families as well as the local community and society at large. CSR is the economic, legal, ethical and discretionary expectations that society has of organizations at a given point in time  . There are four areas that should be measured no matter what the outcome of CSR is needed  . He says that these measurements are given in four profound functions of CSR. The first one is the economic, legal, ethical and discretionary functions. The economic function refers to society’s expectations that organizations will produce goods and services that are needed and desired by customers and sell those goods and services at reasonable prices. The organizations are expected to be profitable, efficient and to keep stakeholders interests in mind. The legal responsibility relates to the expectations that organizations will comply with the laws set down by society to govern competition in the market place, including and not limited to consumer and product laws, environmental and employment law. Ethical responsibility concerns societal expectations that go beyond the law such as the expectations that organizations will conduct their affairs in a just and fair way. They must make proactive efforts to anticipate and meet social norms even if those norms are not formally enacted in law. Discretionary responsibility of corporations refers to society’s expectation that organizations could be good citizens through among others, philanthropic support of programs benefiting a community or the nation. It can do this by involving employees in donating their expertise and time in worthy causes. In many countries by law, a corporations’ only responsibility is to make as much money as possible for shareholders (economic responsibility and to obey the law (legal responsibility). Social responsibility holds companies and organizations responsible for the people they affect, directly or indirectly. It holds them responsible for inaction or indecision based on the idea that a company or an organization has the power to help people or at the least not harm them. It is a doctrine that says that every being whether it is a village, town, state, corporation, organization, government or individual has responsibility to society. This society includes people within which the company operates and those who buy and others who interact with the organization. The discretionary responsibility is part of CSR that is left purely to the management of an organization to make a choice on whether to undertake CSR activities out of their own volition. They also have the discretion to decide which areas to undertake CSR and those not to. The approaches that an organization takes to undertake CSR vary from one organization to another, and consequently, the strength of an organizations commitment to CSR ranges from low to high. There four basic approaches that are used to show this strengths  . They are as demonstrated and discussed. Obstructive approach (Figure 1, level 1) is the lowest of the four approaches. The organizational management chooses not to act in a socially responsible manner but instead behaves unethically and illegally. They do all they can to prevent knowledge of their behavior from reaching other organization stakeholders and the society large. In defensive approach (Figure 1, level 2) the manager indicates at least a commitment to undertake CSR activities. The manager stays within the law and abides strictly with legal requirements but makes no attempt to exercise CSR beyond what the law dictates. They maximize shareholders interest as long as they are within the law. In this approach (Figure 1, level 3) the manager acknowledges the need to support CSR and tries to balance the interests of different stakeholders and shareholders. They agree that organizational members ought to behave legally and ethically and make choices that are reasonable in the eyes of society and wants to do the right thing when called on to do so. Figure 1. Approaches to CSR Activities. manner and going out of their way to learn about the needs of different stakeholders so as to utilize organizational resources to promote society interests. From these proactive perspectives, it is noted that a company has its own stakeholders who are directly or indirectly affected by its CSR activities. According to Post, Lawrence and Weber, stakeholders are individuals and groups that are affected by an organization’s policies, procedures and actions. A stake implies that one has an interest or share in the organization and its operation. The followings are some of the responsibilities that a business has towards some of its stakeholders. The business owes its owners, good reputation, profit growth and expansion. The management requires the organization to realize its objectives, gain competitive advantage, and grow and gain good reputation. The employees need career development, fair remuneration, health and safety, security of tenure, good reputation, motivation, rewards and recognition. Customers need quality products and services, fair prices, efficiency, autonomy and consistency in supply of goods and services. Suppliers need security and reasonable tenders, prompt payment, loyalty, fair treatment and prioritization. The creditors require prompt payments, fair interest and loyal debtors. The shareholders (owners) need dividends, profits and organizational growth. The competitors need prize controls, fair competition and respect while the public requires development of infrastructure, creation of job opportunities and reduction in social crimes. The government needs timely tax payments, economic growth and adherence to government rules and regulations. Diagrammatically, this is how a business organization relates with its stakeholders. The diagram above (Figure 2) demonstrates the relationship between a business and its key stakeholders. 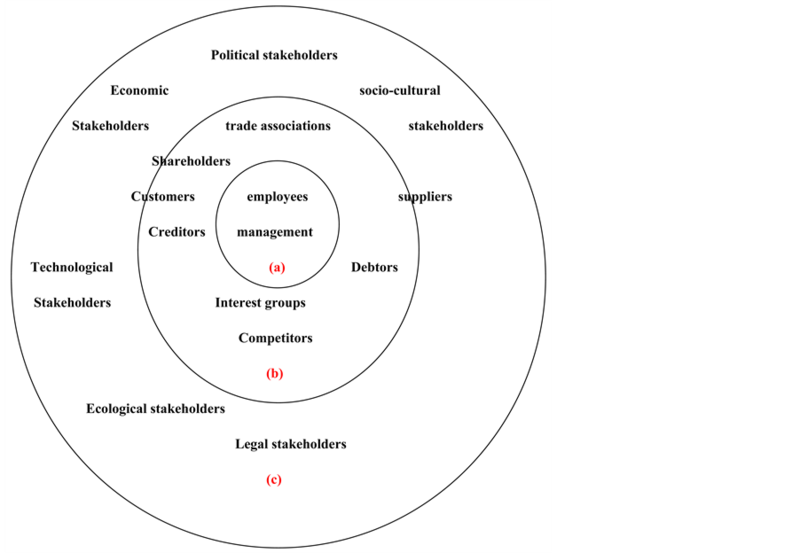 The inner circle (Figure 2(a)) represents the business itself with the chief stakeholders being the employees and the management. The second circle (Figure 2(b)) represents the immediate environment that intimately interacts with the business environment and that which gets direct impact of the CSR activities undertaken by the business enterprise. The third circle (Figure 2(c)) represents the remote environment that denotes the relationship between a business enterprise and the larger business community that encompasses the political and economic players that include the government among others. Others are the socio-cultural and legal players not leaving out the ecological and the technological players. Figure 2. Key CSR Stakeholders. good or bad in terms of its products and services and how they impact on local communities or how it treats and develops its workforce. They forget that the inner circle (Figure 3(b)) and the second inner one (Figure 3(c)) are even more important since they are the ones interacting directly with each other given that Figure 3(c) is the business or internal operating environment and Figure 3(b) is the task or immediate operating environment. Corporations deal with a wide variety of social issues and problems. The most glaring ones involve global issues, the environment and technology. Globalization can lead to exploitation of developing nations and its worker and human rights abuse. Recently noted is the ill treatment that young domestic workers are receiving when they seek international domestic work to make ends meet. Globalization also tends to benefit the wealthy nations; widen the gap between the developed and less developed nations since they are called upon to help with expatriate knowledge. Corporations operating internationally also are bombarded with new social and economic set-ups especially in salaries and working conditions that differ with their local or national set-up. They find themselves contravening CSR policies unknowingly e.g. employment of minors differs significantly around the world. Another burning global issue touching on CSR is dumping of expired or banned products into the less developed country markets. Though the dumping may not be forced on the said country, it is still a contravention of CSR policies. Figure 3. Diagram by Mallen Baker. corporations. Biotechnological organizations raise social issues of embryonic stem cells, genetic engineering and cloning whose effects on the society may not be quantifiable and which could have far reaching societal and ethical, implications. We are also not lost to the issues of hacking, internet plagiarism, imitations and unscrupulous competition. Corporations are renowned for their adverse effect on the environment through wastage or depletion of natural resources, pollution and global warming especially through use of fossil fuel. The environment is also affect by waste disposal, deforestation, acid rain and soil degradation all thanks to business organizations. At the world economic forum at Davos in 1997, Sir Richard Skyes―Chairman of the Global business council on HIV/AIDs said that businesses have to engage with the real world, act as an advocate and keep aids on the international agenda. At the meeting, corporate leaders, international agencies and governments discussed the contributions businesses that can make to reduce the impact of HIV/AIDS on society and organizational productivity. Nelson Mandera (the then south African President), who headed the initiative echoed skyes sentiments said that businesses must respond to HIV/AIDS for its own good and what is good for them is invariably good for the community. Studies in southern and eastern Africa conducted by the African Medical and Research Foundation, AMREF, and for the U.S. Organizations, AIDSCAP, reached the same conclusion. For many organizations that profess to play CSR, the following dimensions of CSR performance must be in place. In this, there should be community involvement, donations (both given and received), community economic development and locally directed investments. This includes equal opportunity (internal), equal opportunity (external), employee’s relations employee standards, performance review compensation, employee empowerment, employee growth, employee termination and flexible working hours. Organizations have to comply with CSR policies regarding employee health and safety, benefits, flexi working time and compensation among others. There should be frequency performance and contract review geared to upgrading of the employees. They should be given platforms to provide their views and opinions on how firms are being run and ideas on change. They should be allowed freedom of expression as well as be supported for professional and personal development through internal training programs, financial assistance and freedom of participation outside the organization. Social responsibility also advocates a four stage written policy regarding termination, which includes warning, reprimanding, suspension and termination. It integrates flexible working hours to help employees balance work and family responsibilities. This goes hand in hand with parental/family leave policies. In some organizations especially the private ones, some of the above employees’ rights are not observed, they dent their image as far as CSR is concerned. This includes environmental regulations, environmental policy statement, environmental management, procedure and programs, environmental communications, structure and human resources. Includes consumer protection, advertising and marketing practices, consumer (client) satisfaction, fair and timely payment, ethics policy and dispute resolution. Fiscal responsibility includes fiscal control, fiscal policies and procedures. Includes auditing, monitoring and reporting i.e. social responsibility audits, disclosure and reporting to stakeholders and communication. It includes issues of human rights, employees and environmental standards, purchasing and contracts and community development. From what is portrayed above, many organizations do not come near to do what CSR spells out. there is a lot of literature and much talk of what companies should do but information on and analysis of what companies are actually doing is contrary. One key stakeholder in an organization and one who is easily forgotten is the employee in terms of salaries and wages, bonuses and incentives etc in order to save enough money for CSR. The first way for organizations to use ethicality in CSR is through programs that employees feel directly enhance their benefits given by the corporation like better health care pension schemes etc. employees he notes have a vested interest in what the company does and how it is run. If they feel they are perceived as valuable assets and are treated well, productivity increases. The advocacy here is that if organizations would treat the employee well, they may not need to use CSR platforms as advertising forums since gains from such gimmicks would be gained through employee productivity. Employees have both legal and moral claims on organizations and their resources; however, many organizations rob Peter (employees) to pay Paul (CSR public). Shareholders are another lot that fail to receive their fair deal from organizations with the excuse of organizations undertaking CSR activities. The owners of a firm are among its primary stakeholders. These obligations include and are not limited to adequate return on investments. Many classical theorists of social responsibility led by Nobel economist Milton Friedman (classical view/theory of social responsibility) assert that businesses have no social responsibility other than increasing profits and refraining from engaging in deception and fraud. The same is replicated in the way shareholders are treated. They continue receiving almost zero dividends when organizations are all over displaying their charitability through CSR. The most affected shareholder is the one that buys corporate shares on initial public offer as a precautionary measure. They suffer loss when share price drops and dividends go to a bare minimum. Companies also owe customers quality goods and services, safety and value for their money inter alia. Some organizations compromise on quality to save for CSR. There is a common observation that the money used in CSR activities is still got from the same customer who enjoys the CSR activities. In other words, funds used in CSR are obtained from the public (customer) through charging of high product and service prices. Like earlier said, it is again robbing Peter not to pay Paul this time, but to pay Peter later. Managers are interested in CSR for among other reasons, because it is an expectation of society, to maintain proper image in the public eye, to buy customer loyalty, for long-run profit and to discourage government regulation. Ferrel actually confirms that CSR is primarily a selfish drive by some organizations—selfish drive by some organizations; a self-serving gimmick to others. To quote Martin Luther King Jr., “As long as there is poverty in the world, I can never be rich; As long as diseases are rampant, I can never be healthy; I can never be what I ought to be until you are what you want to be”. Martin emphasizes the genuineness of what one does―Not for self gain but for the good of the society. A socially responsible organization interacts with its clients in a fair and honest way. They comply with all relevant consumer protection laws and regulations especially by marketing its goods and services in a truthful way and avoiding false claims. They advertise without discriminating against or stereotyping any person or group. Unfortunately what some organizations display in their advertisements goes contrary to this where women are exploited in advertisement. Some of them overlook the physically challenged especially the visual or hearing impaired by failing to make compliant advertisements to take care of every section of the society. Organizations are socially responsible to the government by ensuring they honor their pledges on taxes, licensing, registration and honesty in conducting legal businesses amongst other obligations. On environment, organizations have the obligation to minimize their impact on the environment. Employees have to be trained to assist in implementing procedures and programs aimed at minimizing or better still eliminating pollution. On the contrary, this is not what is happening today. Some organizations are experts in evading taxes that was demonstrated when it was made mandatory that they operate with ETR machines. Pollution is very rampant as it observed with Nairobi River and Dandora dam where waste and all manner of garbage is dumped with impunity. Organizations may not be wholly to blame for flouting CSR policies. Some of them are dogged down by their histories and especially sponsor influence which dictates which CSR activities are to be undertaken with minimal attention to others i.e. some organizations sponsor some events continuously without due consideration whether this is what the consumer needs at that particular moment, thus bringing another observation that the consumer of the CSR product or service is never consulted so that his needs are prioritized and addressed through the CSR activity. Organizations could be entertaining people through safari rallies while what the public needs at that particular time is a physiological need like food or shelter e.g. the IDPS yet the CSR program addresses actualization or esteem needs. These funds could be utilized better to curb for example the AIDS scourge since in a country where 15% of the population is living with HIV/AIDS; the country suffers 1% of decreases in GDP per year. Therefore, corporate resources could be gainfully utilized to train especially the vulnerable groups to fight AIDS. Some CSR activities could be directed to promote minority rights and vulnerable groups in society e.g. women. Many organizations are quite conservative in their giving because their main focus is on making money. Research conducted in Brazil shows that only 10% of corporate groups promote women rights. Some opponents of CSR argue that some organizations management is ill-equipped to address social problems. They opine that business executives and managers are typically well trained in the way of finance, marketing and operations management but not well versed in dealing with complex societal problems, thus they do not have the knowledge or skills needed to deal with CSR. Does the business work with the community to fix outstanding issues and social problems? What issues are they addressing? To what depth are the problems that they are working to fix? Are they fixing major issues like drug addiction in impoverished areas, providing recreation activities for youth? Are they fixing a large social problem with far-reaching consequences or a localized one that is area specific? The competitive argument recognizes the fact that addressing social issues comes at a cost to business and therefore socially responsible ventures hurt a firm’s competitive position and reduces shareholders interest. It is in many people’s opinion that the costs are passed back to the public (customers) in form of increased prices or compromised quality standards. CSR, like any other organization activity that involve use of organizational resources should be audited. These audits monitor and publicly report organizations social and environmental performance to ensure accountability to all its stakeholders. It should also have a written and public policy that commits it to full public disclosure and the protection of internal critics, (Whistle blowers), those who raise issues concerning organization contravention of CSR activities. This disclosure should be complete accurate, objective, understandable and public. Accountability for people inside the organization is something new. Many times when a scandal or irresponsible behavior comes to light in the corporate world, the organization and those involved often try to distance themselves as much as possible, then cover-ups, buy-offs and “ golden parachutes” all fall under this behavior. An organization should take the blame and do what is needed to fix the problem rather than committing more crimes to cover up the first one. CSR is a vital component of a corporate activity. Therefore, it cannot be wished away but instead organizations should seek to do it in the right way. The review brings to fore, pertinent issues in CSR, ranging from failure to undertaking CSR, to malpractices in the way it is undertaken, ignorance in the way it is done and CSR activities as contemporary societal issues. A contemporary school of thought opines that a business operates on the basis of an implied social contract with the members of the society and therefore it is obligated to give back to society. Some organizations have increased commitment to CSR in good times and cut back their CSR initiatives entirely if profits temporarily turn to losses. CSR should be an ongoing commitment rooted in corporate culture. A sizeable proportion of the funding for an organizations CSR strategy has to be viewed as a regular and ongoing cost of doing business,  . Organizations lack adequate knowledge to dispense CSR activities because the top executive entrusted with these activities are ill-equipped to undertake them. Trainings should be undertaken to sensitize corporations on the importance of undertaking sincere CSR activities, to desist from taking CSR as advertisement platforms or public sideshows but rather as activities geared to addressing society’s felt needs. It is the small things that we do with a clean heart that go a long way in creating and impacting positive change. It is no secret that sooner than later, CSR will be an every organization’s concern. Donations of money and time to communities and charities are more prevalent in Asia pacific and North America than in Europe. In Asia, the need to push socially responsible criteria or codes of ethics through the supply chain enjoys greater prominence than elsewhere. The watch noted that 5 years ago in 1999, CSR was on the fringes of most corporate thinking. It was an interesting idea then but now it has moved to centre stage. Nearly 70% of executives believe that CSR and community involvement is integral in their company’s reputation. It is on this platform that it can be concluded that any organizations worth its salt must embrace CSR and practice it as is decorously intended. Against the background on which the review is based it is prudent to make the following recommendations. 1) Organizations must purpose to make CSR part and parcel of their day to day activities; let it be given precedence in the way rather than that routine organizational activities are prioritized. 2) The consumers of CSR activities should be given the mandate to choose what they earnestly need to be provided or addressed through CSR activities. 3) There is need for adequate training cutting across all cadres of employees to ensure readiness and ability to carry out CSR activities. More specifically, top management should be thoroughly trained on how to handle CSR. 4) Social audits should be conducted regularly to gauge organizational ethicality and conduct in the domain of CSR. 5) Since organizations don’t publicly display their day to day activities, let them not exhibit their CSR activities by calling the media to cover. It dilutes the genuineness of their generosity; actually it makes it appear more of an advertisement than CSR. Carroll, A. and Buchholtz, A. (2003) Business and Society: Ethics and Stakeholder Management. Cengage Learning, Stamford. Preston, L.E. (1975) Corporation and Society: The Research for a Paradigm. Journal of Economic Literature, 13, 434-454. Wartick, S. and Cochran, P. (1985) The Evolution of Corporate Social Performance. McGraw-Hill, New York. Parsons, E.A., Shils, K.D. and Pitts, J.R. (1961) Theories of Society: Foundations of Modern Sociological Theory. Free Press, New York. Kaliski, B.S. (2007) Encyclopedia of Business and Finance. Macmillan Publishers, Detroit. Ferrel, F. (2005) Business Ethics: Ethical Decision Making and Cases. Houghton Mifflin Co., Boston. Ondernemen, G. (2006) Management. Amsterdam University Press, Amsterdam. Thompson, et al. (1940) Strategy: Winning in the Market Place: Core Concept, Analytical Tools and Cases. 2nd Edition, McGraw Hill, New York. O’Riodan, L. and Fairbrass, J. (2008) Corporate Social Responsibility: Models and Theories in Stakeholder Dialogue. Scholl of Management, University of Bradford, Bradford.